Following Leap Of Faith, it would be several years before another Hardyz DVD. By the time Twist Of Fate came out, both Matt and Jeff had left WWE and returned, having gone through numerous trials and tribulations, but both seemed to have real potential in singles competition as 2008 began. Intriguingly, we have two documentaries, one for each brother. Matt's is better as it recaps the TLC era of Hardy matches and runs through their Teenage Wrestling Federation and Omega in more depth than Jeff's feature does; plus, his documentary is around 15 minutes longer. The highlights of Matt's feature come as we go through the Version One character, his feud with MVP and, between those, a lengthy look at the real-life controversy involving Matt, Edge and Lita. For those unaware, Matt and Lita had been an item since 1999, and Edge was longtime friends with both. While Matt rehabilitated a knee injury in 2004-2005, Lita and Edge had an affair (Edge was married to another woman too). When Matt discovered the truth, he ended his relationship with Lita and told fans what had happened online. WWE then very harshly sacked Matt, leaving Lita and Edge unpunished. As fans justifiably slated WWE, Edge and Lita, the company decided to firstly put the devious duo together on-screen, and then to bring back Matt for a worker shoot feud with his former friend and girlfriend. This section does a good job of covering the situation from start to finish, and whilst it's fair to say that the feud didn't quite meet expectations (largely because Matt lost), it was undeniably gripping to watch. Some argue that Matt never truly recovered from the real-life break-up, with his regrettable incidents in later years partly being attributed to the pain of his split from Lita. But he is now happily married to another lady (and a wrestler too, Reby Sky), and they have a son (as TNA fans will know), so at least he is now in a better place. After covering the Hardyz reunion in 2006/7, the first doc ends with Matt going through his feud so far with MVP, and his plans to win the United States Title and, eventually, the World Title. Why WWE didn't wait until after Matt beat MVP for the U.S. Title to release this DVD, I don't know. As for Jeff: their shared history means that his feature only stands out due to a section on his music and his home (which would soon burn down, incidentally), his drugs-related exit from WWE in 2003, a brief mention of TNA as he talks about his stint away, his 2006 return to WWE after proving he was clean (which ignores his 2007 Wellness Policy violation), and his rise up the ranks in late 2007/early 2008 which made him the hottest star in the company and a sure-fire future WWE Champion. The two main features are entertaining, but it probably would have been better to present this as one long documentary with occasional shifts to Matt and Jeff, due to the level of shared content. They are still worth watching, although WWE would have been better waiting another year to release this set because, by then, both Hardyz had won three singles titles between them (Jeff would win the WWE Championship at Armageddon 2008). Matt's disc largely features singles matches. His Vengeance 2004 No Holds Barred clash with Kane, occurring at the height of a bizarre storyline also involving Lita, is decent; better is the superb Steel Cage battle with Edge from Unforgiven 2005 as part of the aforementioned reality-based love triangle storyline. We then get two SmackDown bouts with Joey Mercury (a qualifier for the 2007 Money In The Bank Ladder match, which features hilarious guest commentary from King Booker) and Mr. Kennedy, which is a really good match. The only doubles clash on Matt's disc is a 1999 bout from Omega, as The Hardyz face The Serial Thrillers, complete with commentary from both Hardyz, Gregory Helms and Shannon Moore. Jeff's disc has two Hardyz matches: the great Royal Rumble 2000 Tables scrap with the Dudleyz and a strong outing against Lance Cade and Trevor Murdoch from Judgment Day 2007. In singles, we see him face and beat Triple H twice (SmackDown circa 2001 and Armageddon 2007), although neither bout holds a candle to the matches they would have in the future. We also see Jeff face Johnny Nitro in a thrilling Steel Cage match at New Year' Revolution 2007, against Shelton Benjamin in his MITB qualifier (during which Shelton nearly breaks his neck) and opposite Umaga in an exciting bout with an amazing finish, back in the Cage from the 2008 Raw Roulette (exactly a year after the NYR Cage match, funnily enough). There are some notable omissions here: none of the Ladder/TLC bouts are included (although they have admittedly been released many times before), and the WrestleMania 23 MITB bout is also absent (bear in mind that both brothers' qualifying matches for the 2007 MITB scrap are here). What's more, the Jeff-Umaga bout helped to promote Jeff's big WWE Title showdown with Randy Orton at Royal Rumble 2008, but that major encounter has also been left off the set. On the whole, though, the matches are pretty good, despite not being a definitive history of their careers by any means. There are some bonus segments (such as a tour of Matt's house), and a couple more are hidden by pressing arrows at certain points on the menus (these are known as Easter Eggs). One involving Matt, Jeff, Helms and Moore is noteworthy because it's about toasting their friendship with beers, and during this Helms unnecessarily slags off CM Punk (who hadn't yet become a main eventer in WWE), calling him a dweeb for not drinking, which is backed up by the others in the room. It's a blink-and-you-miss-it moment, but it's an insight into how certain wrestlers treated Punk due to his Straight-Edge lifestyle. Not that Punk would be bothered, to be fair. Ironically, Punk ended up becoming a bigger star than all of those in this segment, and certainly a much bigger star than Helms ever was. Twist Of Fate is enjoyable but by no means a classic. It does perfectly illustrate the potential that both Hardyz had in singles around the spring of 2008. For Matt, a United States Title win would indeed come, and would be followed by an ECW Championship later that year. But a heel turn on Jeff in 2009 would end up harming his career in the long-run, for despite beating Jeff at WrestleMania 25, he would never come close again to achieving his full potential in WWE, and left under acrimonious circumstances in 2010 following a suspension and some baffling online videos. Jeff, meanwhile, would achieve great success as a solo star; because the rest of his WWE run is covered on My Life, My Rules (which I will review soon), I won't go into what came next for him, only to note that by the time this DVD was released, he had lost much of his momentum due to a (second) Wellness Policy violation. 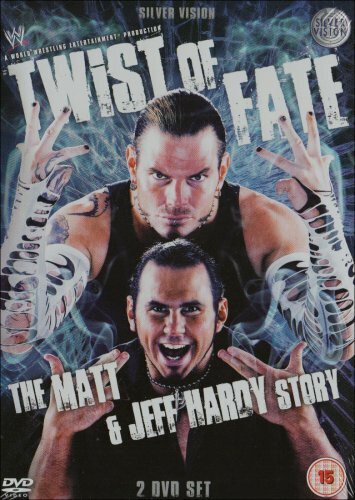 I'll conclude the Hardyz tale in the My Life, My Rules review, but I'll just say that despite its flaws, Hardy fans should really enjoy this particular set, and it's hard to believe from watching this that Matt never did get to ascend to the main event level in WWE. Mind you, had Matt not left WWE, we wouldn't have ended up having the Final Deletion in TNA, so I suppose that's a positive.